EnMart is proud to announce that the Ricoh GX e3300N printers are back in stock. We do have a limited supply and will be selling the QuickStartR packages on a first come, first serve basis. Depending on the time the order is placed, packages may be shipped the same day. Your credit card will not be charged until your order is shipped. The QuickStartR package package is a great way to get started in sublimation or ChromaBlast without spending a great deal of money. 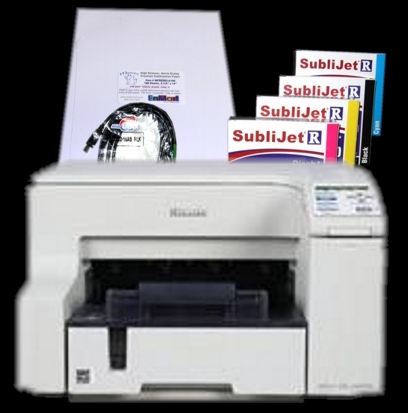 The package includes a Ricoh GX e3300N printer, a complete set (CMYK) of SubliJet R ink, a pack of 8.5 x 11 sublimation paper and a USB cable. This package gives you everything you need to create sublimation transfers. Just add a heat press and some sublimation blanks and you’re in business! Best of all, this package sells for the low price of $399.99. If you’re interested in a printer package, but want to be able to print larger paper sizes, I also wanted to point out that we do have a package centered around our Epson WorkForce 1100 printer. This printer allow you to print up to 13 x 19 sheets out of the box. EnMart has been running an Epson WF 1100 with a bulk system in our offices and we have found it to be a great printer with very little incidence of clogging. This package comes with the Epson WF 1100 printer, 1 kit each of the CMYK 110 ml ink bags, 1 Quick Connect Kit CISS Bulk System, 1 pack of 8.5 x 11 sublimation paper, 1 pack of 13 x 19 sublimation paper and 1 USB cable. The package retails for $749.00. EnMart will also consider made to order package deals for those who need something tailored to their specific Sublimation or ChromaBlast needs. We offer the “Your Way” package discount. If you purchase ANY items from at least 4 of the 5 Sublimation categories, we will manually apply a 5% Package Discount to ALL the sublimation or Chromablast related items, supplies, and accessories on your ENTIRE order. Spend over $2000, and the discount increases to 10%! The more you buy, the more money you save. If you have any questions about any of our prepared packages or about our “Your Way” discount, please contact us for more information.